As urban expansion takes over, little green spaces are left available for the people of Beirut, rendering public spaces one of two kinds; a place of clash or a place of convergence. 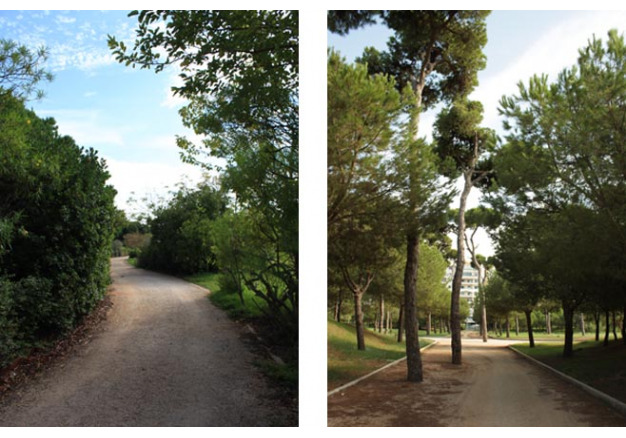 One of the public spaces that always existed in Beirut is the pine forest or "Horsh" as is known to its people. 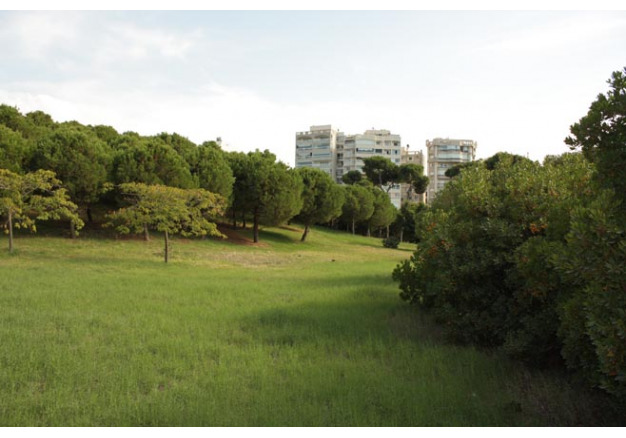 However the natural landscape of the "Horsh" area has witnessed interference from external and internal factors, the former dating back to the beginning of the 1900's when the Ottomans planted pine trees to hold together the sandy dunes that once existed throughout the city of Beirut. And the latter, the rapid urban development which commenced at the beginning of the 1950's by the Lebanese state planning. Moreover, the start of the Lebanese civil war in the 1970's left the pine forest a barren, desolate place sitting on the edge of the city, that same place that was once engraved with the memories of the people who called the "Horsh" their home. 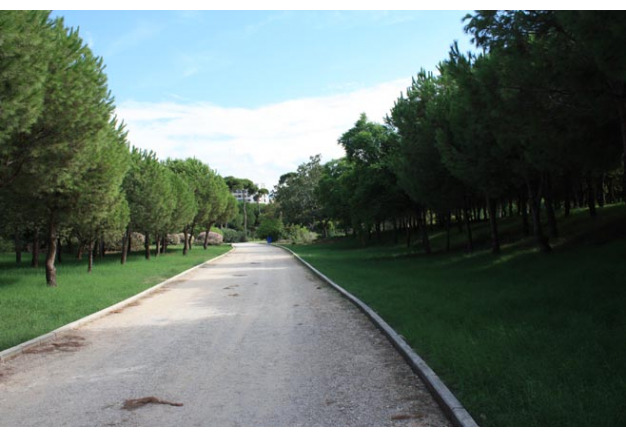 In 1992, an international competition was held for the rehabilitation of the pine forest of Beirut. Fifty international companies bid for the grand prize; the targeted aim was to reintegrate the pine forest or "Horsh" into the lifestyle of the divided people of Beirut; and rendering the pine forest a melting pot of the various sects, ethnicities, and socio-economic classes. 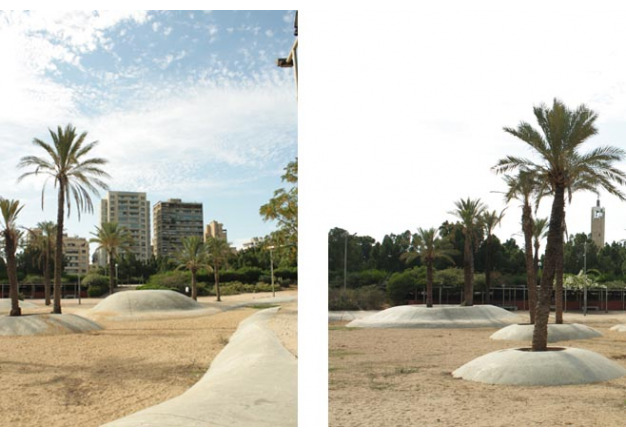 This concept was achieved through the regeneration and reclamation of the pine forest into what can only be described as a safe haven; a neutral recreational space where people of East and West Beirut unite. 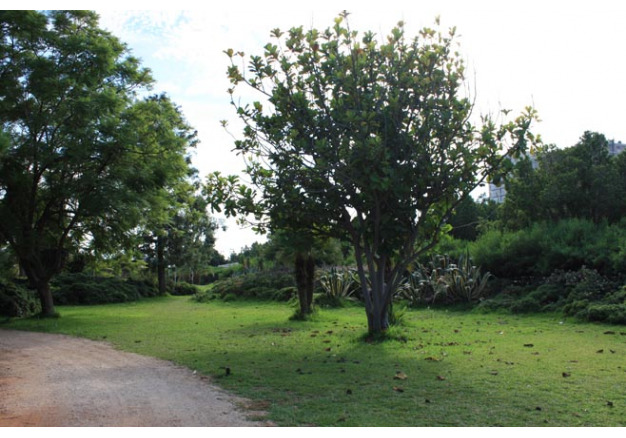 The Greening strategy of the pine forest aims at creating multi-functional educational spaces that display Beirut's biodiversity and carry an array of functions such as: an amphitheater, a children's play area, an oasis adorned with pergolas, botanical gardens, bird cages, rose gardens, picnic areas, and green lawns. 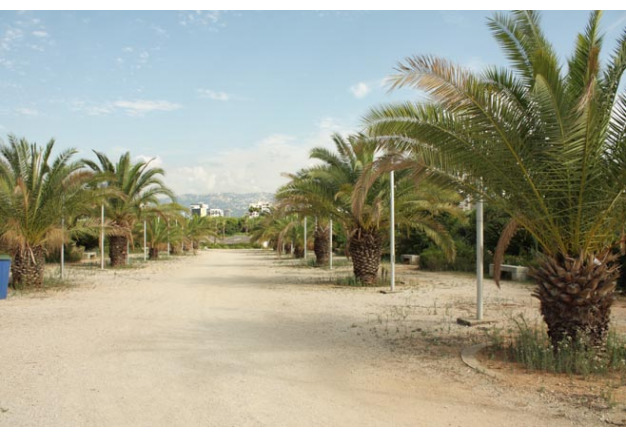 These spaces are joined through interconnected walkways, all with intent to recreate an absent biodiversity and re-emerge the pioneer species, the end result of which, the recreation of a pine forest microclimate. The design lines are a combination of natural forms and axial continuations of the urban fabric adjacent to the designed lot. Aiming to create a landscape in motion and trigger an element of discovery, the design developed into organic forms with an interplay of levels and heights. 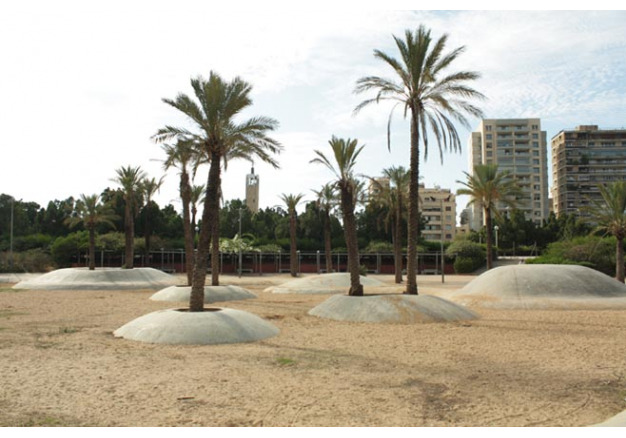 These organic shapes transformed into artificial hills/mounds reminiscent of the sand dune landscape that once defined Beirut. These mounds produced vistas, seclusions, and perspective effects resulting in a playful ambiance. The dunes created rose up to twenty meters in height, the material of which was the rubble of the city following the events of the civil war. This dune-like landscape was created to give visitors a glimpse of what the landscape language was before urbanism took over. The intent of the design was to build on what once was and re-generate the forgotten landscape. The axial continuation was translated into a spine of two hundred Ficus trees meant to serve as a green canopy buffer from the noise and pollution of the aggressive urban atmosphere, all designed to give an element of sensitivity to the rough context in which this area sits. 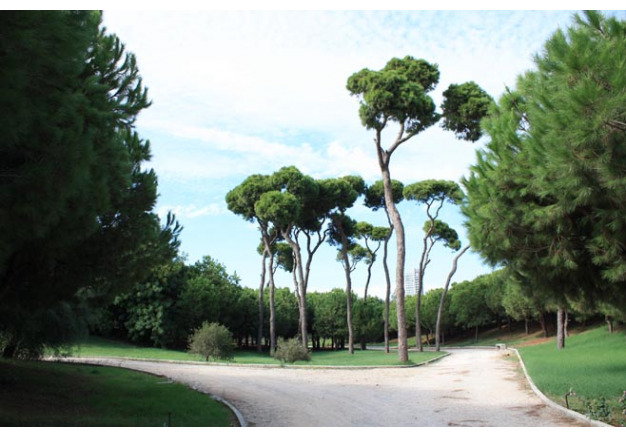 It is important to shed light on the fact that the success of the design is rooted in the preservation of the existing pine trees, the veterans of war, the jewels of the park, around which the design contours where sculpted to protect and integrate the existing vegetation. The softscape layers of the pine forest are diverse and are now home to various indigenous species of the area including: Arbutus unedo, Albizzia julibrissin, Acalypha wilkesiana, Acacia retinoide, Papaver, Plumbago capensis, Acacia selloviana, Delonix regia, Plumeria rubera, Lagestromia indica, Parkensonia sp, Russelia equestifolia, Agave Americana, Ceratonia siliqua, Hibiscus rosa sinsis, Thevitia peruviana, Ficus elastica, Gramine species, Nerium oleander, Schinus molle, Cupressus sempervirens, Eucalyptus, Bougainvillea, Cistus, Stenotapgrum secundatum and Pinus pinea. From the ruins of Beirut devastated by war, to the stitching of fragments of history, a thirty hectare space that holds the secrets of the past and allows nature to take over sits at the center of the city. 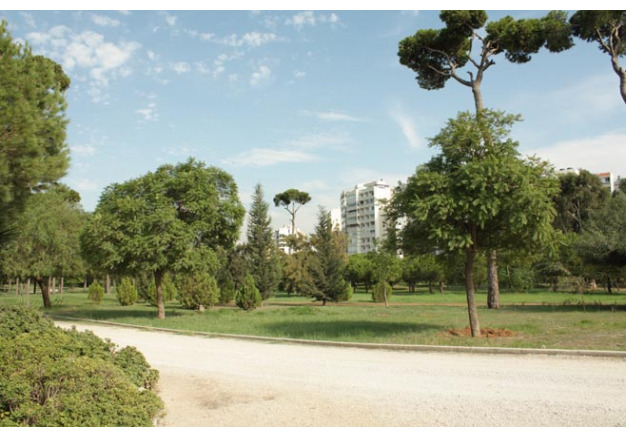 Poetic promenades and natural seclusions bejeweled with 50 year old pine trees that seem to link the earth and sky are home to the green lungs of Beirut. As the sun sets on this urban park, the silent witnesses seem to cast their shadows on the neighboring mountains as if to give back to the city of Beirut, its most valuable possession, the pine forest.